1. 18V 100W Monocrystalline Semi-flexible Solar panels with cable. 3. Resistance to resistance, can withstand different environment, waterproof performance is good. 4. All cell positives and back electrodes are made of high quality silver paste with high welding strength and low series resistance. 5. The use of advanced PE coating technology, the surface of the battery covered with dark blue anti-reflective film uniform, beautiful color. 6. Components can withstand snow pressure up to 5400Pa, to withstand wind pressure up to 2400Pa. 7. Semi-flexible, and can be folded properly to use a wider range of uses. 8. 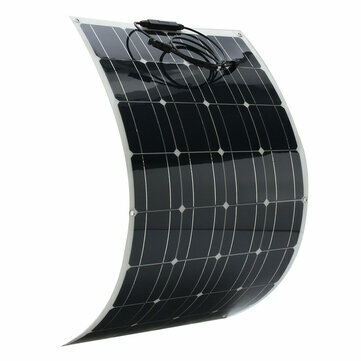 With sunpower chip, can be used for car, home, boat, motorcycle, etc. 9. High conversion efficiency, good output efficiency, low light effect, light weight, easy to carry, strong applicability. 10. Anti-zero, can not afford bubbles, easy to clean. 11. Suitable for car batteries, car, RV, boat, ship, aircraft, satellites, space stations, outdoor breeding, plantation, tourism, solar street lamp. Size: Approx. 1050mmx540x2.5mm / 41.3 "x21.2" x0.098 "